Rosenberg was born on 12 January 1893 in Reval (now Tallinn), Governorate of Estonia, Russian Empire, the capital of modern Estonia, to a family of Baltic Germans. His father, Waldemar Wilhelm Rosenberg, was a wealthy merchant from Latvia, and his mother, Elfriede (née Siré), was a teacher of French language in Reval. The Hungarian-Jewish journalist Franz Szell, who was apparently residing in Tilsit, Prussia, Germany, spent a year researching in Latvian and Estonian archives before publishing an open letter in 1936, with copies to Hermann Göring, Joseph Goebbels, German foreign minister Konstantin von Neurath and others, accusing Rosenberg of having "no drop of German blood" flowing in his veins. Szell wrote that among Rosenberg's ancestors were only "Latvians, Jews, Mongols, and French." As a result of his open letter, Szell was deported by Lithuanian authorities on 15 September 1936. His claims were repeated in 15 September 1937 issue of the Vatican newspaper L'Osservatore Romano. The young Rosenberg graduated from the Petri-Realschule (currently Tallinna Reaalkool) and went on to study architecture at the Riga Polytechnical Institute and engineering at Moscow's Highest Technical School completing his PhD studies in 1917. During his stays at home in Reval, he attended the art studio of the famed painter Ants Laikmaa, but even though he showed promise, there are no records that he ever exhibited. During the German occupation in 1918, Rosenberg served as a teacher at the Gustav Adolf Gymnasium. He gave his first speech on Jewish Marxism on 30 November, at the House of the Blackheads, after the outbreak of the Estonian War of Independence. He emigrated to Germany with the retreating imperial army, along with Max Scheubner-Richter, who served as something of a mentor to Rosenberg and to his ideology. Arriving in Munich, he contributed to Dietrich Eckart's publication, the Völkischer Beobachter (Ethnic/Nationalist Observer). By this time, he was both an antisemite – influenced by Houston Stewart Chamberlain's book The Foundations of the Nineteenth Century, one of the key proto-Nazi books of racial theory – and an anti-Bolshevik. Rosenberg became one of the earliest members of the German Workers' Party – later renamed the National Socialist German Workers' Party, better known as the Nazi Party – joining in January 1919, eight months before Adolf Hitler joined in September. According to some historians, Rosenberg had also been a member of the Thule Society, along with Eckart, although Nicholas Goodrick-Clarke contends that they were only guests. After the Völkischer Beobachter became the Nazi party newspaper in December 1920, Rosenberg became its editor, in 1923. Rosenberg was a leading member of Aufbau Vereinigung, Reconstruction Organisation, a conspiratorial organisation of White Russian émigrés which had a critical influence on early Nazi policy. In 1923, after the failed Beer Hall Putsch, Hitler, who had been imprisoned for treason, appointed Rosenberg as the leader of the National Socialist movement, a position he held until Hitler's release. Hitler remarked privately in later years that his choice of Rosenberg, whom he regarded as weak and lazy, was strategic; Hitler did not want the temporary leader of the Nazis to become too popular or hungry for power, because a person with either of those two qualities might not want to cede the party leadership after Hitler's release. However, at the time of the appointment Hitler had no reason to believe that he would soon be released, and Rosenberg had not appeared weak, so this may have been Hitler reading back into history his dissatisfaction with Rosenberg for the job he did. In Rome during November 1932 Rosenberg participated in the Volta Conference about Europe. British historian Sir Charles Petrie met him there and regarded him with great distaste; Petrie was a Catholic and strongly objected to Rosenberg's anti-Jewish and anti-Catholic sentiments. As the Nazi Party's chief racial theorist, Rosenberg oversaw the construction of a human racial "ladder" that justified Hitler's racial and ethnic policies. Rosenberg built on the works of Arthur de Gobineau, Houston Stewart Chamberlain, Madison Grant, the Klansman Lothrop Stoddard as well as on the beliefs of Hitler. Rosenberg placed Blacks and Jews at the very bottom of the ladder, while at the very top stood the white "Aryan" race. Rosenberg promoted the Nordic theory which regarded Nordics as the "master race",[notes 1] superior to all others, including to other Aryans (Indo-Europeans). He was also influenced by the Judeo-Masonic conspiracy theory promoted by the Catholic counter-revolutionary tradition, such as the book Le Juif, le judaïsme et la judaïsation des peuples chrétiens (1869) by Roger Gougenot des Mousseaux, which he translated into German under the title The Eternal Jew. Rosenberg got the racial term Untermensch from the title of Stoddard's 1922 book The Revolt Against Civilization: The Menace of the Under-man, which had been adopted by the Nazis from that book's German version Der Kulturumsturz: Die Drohung des Untermenschen (1925). Rosenberg reshaped Nazi racial policy over the years, but it always consisted of Aryan supremacy, extreme German nationalism and rabid antisemitism. Rosenberg also outspokenly opposed homosexuality – notably in his pamphlet "Der Sumpf" ("The Swamp", 1927). He viewed homosexuality as a hindrance to the expansion of the Nordic population. Rosenberg's attitude towards Slavs was flexible and depended on the particular nation involved. [notes 2][notes 3] As a result of the ideology of "Drang nach Osten" ("Drive to the East"), Rosenberg saw his mission as the conquest and colonization of the Slavic East. In Der Mythus des 20. Jahrhunderts Rosenberg describes Russian Slavs as being overwhelmed by Bolshevism. [notes 4] Regarding Ukrainians, he favoured setting up a buffer state to ease pressure on the German eastern frontier, while agreeing with the notion of the exploitation of Russia for the benefit of Germany. During the war, Rosenberg was in favour of collaboration with the East Slavs against Bolshevism and offering them national independence unlike other Nazis such as Hitler and Himmler who dismissed such ideas. In 1940 Rosenberg was made head of the Hohe Schule (literally "high school", but the German phrase refers to a college), the Centre of National Socialist Ideological and Educational Research, out of which the Einsatzstab Reichsleiter Rosenberg developed for the purpose of looting art and cultural goods. The ERR were especially active in Paris in looting art stolen from famous Jewish families such as the Rothschilds and that of Paul Rosenberg. Hermann Göring used the ERR to collect art for his own personal gratification. He created a "Special Task Force for Music" (Sonderstab Musik) to collect the best musical instruments and scores for use in a university to be built in Hitler's home town of Linz, Austria. The orders given to the Sonderstab Musik were to loot all forms of Jewish property in Germany and of those found in any country taken over by the German army, and any musical instruments or scores were to be immediately shipped to Berlin. Following these plans, when Wehrmacht forces invaded Soviet-controlled territory, they immediately implemented the first of the proposed Reichskommissariats of Ostland and Ukraine, under the leadership of Hinrich Lohse and Erich Koch, respectively. The organization of these administrative territories led to conflict between Rosenberg and the SS over the treatment of Slavs under German occupation. As Nazi Germany's chief racial theorist, Rosenberg considered Slavs, though lesser than Germans, to be Aryan. Rosenberg often complained to Hitler and Himmler about the treatment of non-Jewish occupied peoples. He proposed creation of buffer satellite states made out of Greater Finland, Baltica, Ukraine, and Caucasus. Since the invasion of the Soviet Union intended to impose the New Order, it was essentially a war of conquest. German propaganda efforts designed to win over Russian opinion were, at best, patchy and inconsistent. Alfred Rosenberg was one of the few in the Nazi hierarchy who advocated a policy designed to encourage anti-Communist opinion among the population of the occupied territories. His interest here was mainly in the non-Russian areas such as Ukraine and the Baltic States; however, supporters of the Russian Liberation Army were somewhat able to win him over. Amongst other things, Rosenberg issued a series of posters announcing the end of the Soviet collective farms (kolkhoz). He also issued an Agrarian Law in February 1942, annulling all Soviet legislation on farming and restoring family farms for those willing to collaborate with the occupiers. But decollectivisation conflicted with the wider demands of wartime food production, and Hermann Göring demanded that the collective farms be retained, save for a change of name. Hitler himself denounced the redistribution of land as "stupid". He was sentenced to death and executed with other condemned co-defendants at Nuremberg Prison on the morning of 16 October 1946. His body, like those of the other nine executed men and that of Hermann Göring, was cremated at Ostfriedhof (Munich) and the ashes were scattered in the river Isar. Throughout the trial, it was agreed that Rosenberg had a decisive role in shaping Nazi philosophy and ideology. Examples include: his book Myth of the Twentieth Century, which was published in 1930, where he incited hatred against "Liberal Imperialism" and "Bolshevik Marxism"; furthering the influence of the "Lebensraum" idea in Germany during the war; facilitating the persecution of Christian churches and the Jews in particular; and opposition to the Versailles Treaty. Hitler was a leader oriented towards practical politics, whereas, for Rosenberg, religion and philosophy were key and he was the most culturally influential within the party. Several accounts of the time before the Nazi ascension to power, indeed, speak of Hitler as being a mouthpiece for Rosenberg's views, and he clearly exerted a great deal of intellectual influence. The question of Rosenberg's influence in the Nazi Party is controversial. He was perceived as lacking the charisma and political skills of the other Nazi leaders, and was somewhat isolated. In some of his speeches Hitler appeared to be close to Rosenberg's views, rejecting traditional Christianity as a religion based on Jewish culture, preferring an ethnically and culturally pure "Race" whose destiny was supposed to be assigned to the German people by "Providence". In others, he adhered to the Nazi Party line, which advocated a "positive Christianity". After Hitler's assumption of power he moved to reassure the Protestant and Catholic churches that the party was not intending to reinstitute Germanic paganism. He placed himself in the position of being the man to save Positive Christianity from utter destruction at the hands of the atheistic antitheist Communists of the Soviet Union. This was especially true immediately before and after the elections of 1932; Hitler wanted to appear non-threatening to major Christian faiths and consolidate his power. Furthermore, Hitler felt that Catholic-Protestant infighting had been a major factor in weakening the German state and allowing its dominance by foreign powers. Some Nazi leaders, such as Martin Bormann, were anti-Christian and sympathetic to Rosenberg. Once in power, Hitler and most Nazi leaders sought to unify the Christian denominations in favor of "positive Christianity". Hitler privately condemned mystical and pseudoreligious interests as "nonsense". However, he and Joseph Goebbels agreed that after the Endsieg (Final Victory) the Reich Church should be pressed into evolving into a German social evolutionist organisation proclaiming the cult of race, blood and battle, instead of Redemption and the Ten Commandments of Moses, which they deemed outdated and Jewish. Rosenberg was married twice. In 1915, he married Hilda Leesmann, an ethnic Estonian; they divorced in 1923. Two years later, in 1925 he married Hedwig Kramer, to whom he remained wed until his execution by the Allies. He and Kramer had two children: a son who died in infancy and a daughter, Irene, who was born in 1930. During the Nuremberg trials, Rosenberg's handwritten diary was translated by Harry Fiss, Chief of Documentation for the American prosecution. After its use in evidence during the Nuremberg trials, the diary went missing, along with other material which had been given to the prosecutor Robert Kempner (1899–1993). It was recovered in Lewiston, N.Y., on 13 June 2013. Written on 425 loose-leaf pages, with entries dating from 1936 through 1944, it is now the property of the United States Holocaust Memorial Museum (USHMM) in Washington. Henry Mayer, the museum's senior archivist, and the son of a Holocaust survivor, was able to access the material and while "not given enough time to read [the] diary entry from beginning to end," he "could see that Rosenberg focused on certain subjects, including brutality against Jews and other ethnic groups and forcing the civilian population of occupied Russia to serve Germany." Meyer also noted Rosenberg's "hostile comments about Nazi leaders," which he described as "unvarnished." While some parts of the manuscript had been previously published, the majority had been lost for decades. Former Federal Bureau of Investigation agent Robert King Wittman, who helped track down the diary, said, "there is no place in the diary where we have Rosenberg or Hitler saying the Jews should be exterminated, all it said was 'move them out of Europe'". The New York Times said of the search for the missing manuscript that "the tangled journey of the diary could itself be the subject of a television mini-series." Since the end of 2013, the USHMM has shown the 425-page document (photos and transcripts) on its homepage. ^ Hexham, Irving (2007). "Inventing 'Paganists': a Close Reading of Richard Steigmann-Gall's the Holy Reich". Journal of Contemporary History. SAGE Publications. 42 (1): 59–78. doi:10.1177/0022009407071632. ^ "Alfred Rosenberg". Jewish Virtual Library (American-Israeli Cooperative Enterprise). Retrieved 7 May 2008. ^ Steiner, J.M. (1976). Power Politics and Social Change in National Socialist Germany: A Process of Escalation Into Mass Destruction. Mouton. p. 411. ISBN 9789027976512. Retrieved 10 October 2014. ^ Staff (March 2008) "Szell, Franz (fl 1936-1937): correspondence regarding Alfred Rosenberg" (catalog entry) Wiener Library Quote: "Franz Szell, an exiled Hungarian journalist apparently resident in Tilsit, Lithuania spent more than a year in the archives in Latvia and Estonia researching Alfred Rosenberg's family history with a view to publishing the open letter, 936/1." ^ "Der Nürnberger Prozeß, Hauptverhandlungen, Einhundertachter Tag. Montag, 15. April 1946, Nachmittagssitzung". zeno.org. Retrieved 16 August 2015. ^ Hasenfratz, H. P. (1989). "Die Religion Alfred Rosenbergs". Numen. 36 (1): 113–126. doi:10.2307/3269855. JSTOR 3269855. ^ a b c Evans, Richard J (2004). The Coming of the Third Reich. London: Penguin Books. pp. 178–179. ISBN 0-14-100975-6. ^ Speer, Albert (1970). Inside the Third Reich: Memoirs by Albert Speer. Translated by Richard and Clara Winston. New York: Macmillan. p. 115. ^ "Dr. Rosenberg's Wreath." Times [London, England] 12 May 1933: 11. The Times Digital Archive. Web. 6 February 2014. "There was a further charge against [James Edmond Sears] of wilfully damaging the wreath which was laid on the Cenotaph on Wednesday by Dr Rosenberg on behalf of Herr Hitler". ^ "Hitler’s wreath at the Cenotaph | Great War London". greatwarlondon.wordpress.com. Retrieved 10 October 2014. ^ Michael, R. (2008). A History of Catholic Antisemitism: The Dark Side of the Church. Springer. p. 128. ^ "Churchmen to Hitler". Time Magazine. 10 August 1936. Retrieved 14 August 2008. ^ Bonney, Richard (2009). Confronting the Nazi War on Christianity: The Kulturkampf Newsletters, 1936-1939. Studies in the history of religious and political pluralism. 4. Bern: Peter Lang AG, International Academic Publishers. p. 122. ISBN 9783039119042. ^ "Georg Leibbrandt | Jewish Virtual Library". jewishvirtuallibrary.org. Retrieved 10 October 2014. ^ "Allies Capture Nazi Pagan Philosopher". Northern Star (Lismore, NSW : 1876–1954). Lismore, NSW: National Library of Australia. 22 May 1945. p. 4. Retrieved 30 September 2013. ^ "The Avalon Project : Judgment : Rosenberg". avalon.law.yale.edu. Retrieved 16 August 2015. ^ "International Military Tribunal: The Defendants". ushmm.org. Retrieved 16 August 2015. ^ "Alfred Rosenberg Nuremberg Charges". web.archive.org. Archived from the original on 29 August 2000. Retrieved 16 August 2015. ^ "J. Kingsbury-Smith; Honored Journalist - LA Times, 06, February, 1999". articles.latimes.com. Retrieved 16 August 2015. ^ Richard Steigmann-Gall (2003). The Holy Reich: Nazi conceptions of Christianity, 1919–1945. Cambridge University Press. pp. 91–. ISBN 978-0-521-82371-5. Retrieved 24 October 2010. ^ Kershaw, Ian (2001). The 'Hitler Myth': Image and Reality in the Third Reich. Oxford University Press. p. 109. ISBN 0-19-280206-2. OCLC 47063365. Hitler's evident ability to simulate, even to potentially critical Church leaders, an image of a leader keen to uphold and protect Christianity was crucial to the mediation of such an image to the church-going public by influential members of both major denominations. It was the reason why church-going Christians, so often encouraged by their 'opinion-leaders' in the Church hierarchies, were frequently able to exclude Hitler from their condemnation of the anti-Christian Party radicals, continuing to see in him the last hope of protecting Christianity from Bolshevism. ^ Speer 1971, pp. 141,212. ^ Tragakiss, Tamara (November 23, 2005). "Morris Resident Was Translator During Nuremberg War Trials". The Litchfield County Times. Hearst Media Services Connecticut. Retrieved December 31, 2018. ^ a b c d Fenyvesi, Charles (14 June 2012). "Mysteries of the Lost (and Found) Nazi Diaries". National Geographic. ^ Kovaleski, Serge F. (31 March 2016). "Tracking an elusive diary from Hitler's inner circle". Newspaper. The New York Times. pp. C1–2. Retrieved 3 April 2016. ^ Cohen, Patricia (13 June 2013). "Diary of a Hitler Aide Resurfaces After a Hunt That Lasted Years". The New York Times. Retrieved 15 June 2013. ^ Reuters (10 June 2013). "Encontrado el diario de un confidente de Hitler" [Found the diary of a confidant of Hitler]. La Vanguardia (in Spanish). Barcelona, Spain. Archived from the original on 14 October 2013. ^ "Alfred Rosenberg Diary - United States Holocaust Memorial Museum". collections.ushmm.org. Retrieved 16 August 2015. Kellogg, Michael (2005). The Russian Roots of Nazism: White Émigrés and the Making of National Socialism. Cambridge. ISBN 978-0-521-07005-8. 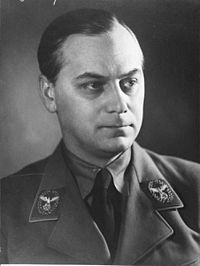 Wikimedia Commons has media related to Alfred Rosenberg.